DIY has never been easier with Dulce Tejeda’s how-to guide to creating your own perfect pair of dyed jeans. 25-year-old Dulce is one busy beauty queen – in addition to being a wife and mom, she’s majorly taken off on and offline. Where did her love for all things stylish come from? The military! After getting out of uniform, she had a desire to express herself through fashion and makeup. Since 2008, Dulce has been captivating YouTube audiences with her advice on fashion and beauty. She knows the power of social media and has been using it to create a career out of her skills, both in fashion & beauty and on the digital side. Her popularity has continued to grow with a fan base of 675, 428 subscribers and and 140,060, 478 views. Dolce’s success has been highlighted in Seventeen magazine and on Huffington Post as one of YouTube top fashion gurus. She’s graced the over of The Stylist’s Handbook and in 2011 she won the honor of being one of Fashion Night Out‘s official bloggers. Dulce’s latest tutorial puts a new spin on the dying trend, something we’ve loved here at FASHIONOTES this season. Her video is a great way to transition the trend into fall, by trading your shorts for jeans and turning them into a one of a kind art project! 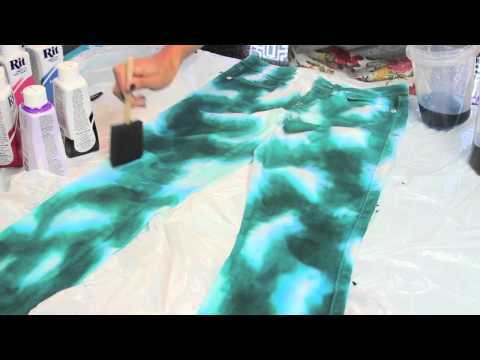 Here’s a rundown of how to whip up a pair of your own tie-dyed pants – to begin, you’ll need a pair of white jeans, clothing dye, two sponge brushes, two plastic containers and garbage bags. To prepare, cut and open the garbage bags to lay down and cover your work area. After shaking your dye (Dulce uses a gorgeous teal color), in one container pour generous amount of the dye with hot water and mix well. This will be your dark shade! To make your light shade, add half a tablespoon of the dye to a container filled with hot water. Dip the sponge brush into the light shade for the base color, and be creative with a design of your choice all over the jeans! Use the other sponge to go over the pattern with the darker shade, allowing the colors to bleed and blend. Do the same with the back side of the jeans. After you’ve Picasso-ed your pants, rinse out the jeans in lukewarm water, until the water runs clear. When the excess dye has been removed, simply throw in the dryer for a few minutes. Ta-da – an original pair of pants that will be sure to turn heads this fall!